Kombe Arrow-Poison is a is a deciduous vine, that can also grow as a shrub. Flowers are cream colored, yellow at the base with red spots and streaks inside. The genus name Strophanthus is derived from the Greek strophos (a twisted cord or rope) and anthos (a flower), thus describing the main peculiarity of the flowers, the petals ending into long, tail-like segments. There is a thick layer of hair on the outside towards the top, while the inside of the flower has very few hairs. The stamen is found near the base of the flower tube. The pistil contains a style a few millimeters in length, with a ring-like head surrounding a minuscule stigma. Flowers are found in clusters of 1-12. The plant generally occurs as a climbing vine that climbs us to the top of tall trees. It can grow up to 3.5 meters, with a stem that grows up to 10 cm in diameter. The bark is a reddish brown, with dark brown, grey or black lenticels. Roots are thick and fleshy. The papery leaves are simple, and found in opposite arrangement. The young leaves are exceptionally hairy on both sides, but as they age, the top of the leaves become smooth. The fruit of the flower contains two seedpods that narrow towards the tip and end in a knob of various sizes. 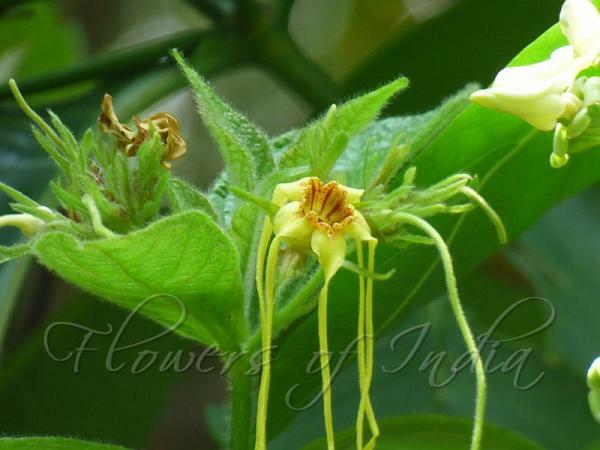 It has two thick and hard-walled compartments containing many spindle shaped seeds. 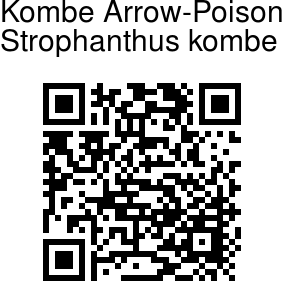 Kombe Arrow-Poison is native to tropical East Africa. Can be found wild in some parts of India. Medicinal uses: Kombe Arrow-Poison is known for its historical use as a source of arrow poison. Today it is used medicinally to treat heart failure. The plant has been used for two extremes, ending a life and saving a life, so proper dosage is crucial when using this plant medicinally. Cardiac glycosides extracted from the seeds reduce the heart rate but increase the force and efficiency of the contractions. Identification credit: Aarti Khale, Shrikant Ingalhalikar Photographed in Lalbagh Botanical Garden, Bangalore.